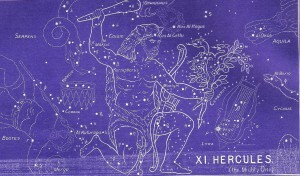 You have undoubtedly heard of this famous mythological hero and his many adventures — twelve in all, called “labors.” He is always represented as a mighty man and one whose assignment from his father was far more demanding than any mortal could have been expected to bear — tasks such as killing the boar of Erymanthus , conquering the Bull of Crete, killing the three-headed Hydra, and many others. It is an interesting study to observe the Lord’s many pains on our behalf in each of these mythological “labors” of Hercules. Go to your local library and check out a book that describes these “labors.” You will find it very easy to then go to the Gospels in the Bible and find them to be foreshadows of Jesus’ blood and tears for us. Here is a man who is kneeling down, as though one of his heels has been injured. In his hand he holds the three-headed Hydra which He clubs to death and then severs its head, which he then sears with fire. We see, too, somewhat of the pain that He suffered in all these labors. Note that He is kneeling, as though his right heel has been bruised! (Link to Virgo and Scorpio for more information). It is obvious that the original truth about the Promised Seed (see Virgo) did contain hints that He would have impossible feats to accomplish. Here is the One, Jesus Christ, who endures the extremities of human suffering for the sake of the ones whom He loves. This is yet another picture of the Suffering Servant who ultimately triumphs over sin and the grave. Notice that the victory over this enemy cost our Lord a wounding of His own.Here is a truth proclaimed by the prophets from the beginning of the world — that God’s specially anointed, His Messiah, would come and would enter into the greatest of all battles, the battles for the souls of men.He would do the impossible, do for man what man cannot do for himself;and in so doing He would suffer pain and humiliation.But the ultimate victory would be His– and the ultimate reward would be nothing less than the eternal salvation of all who put their trust in Him.This is the heart of the good news for man — what must be done has already been done! Amazing Grace! 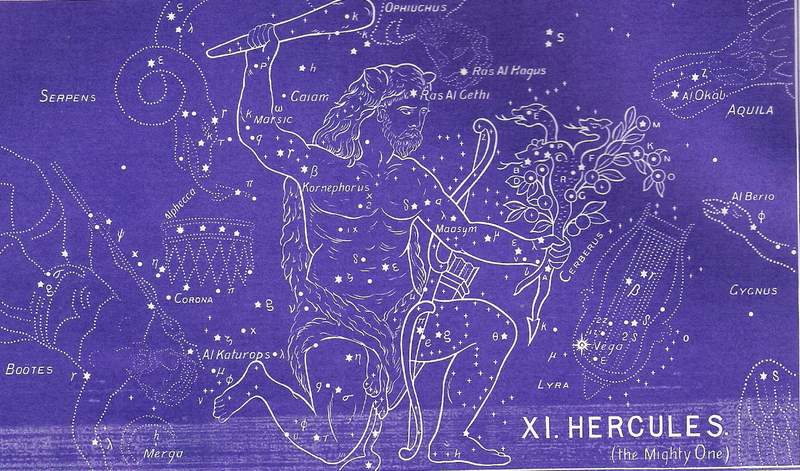 To continue in the correct order of the ancient star chart, please select Sagittarius next. Or click on The Big Picturefor more information about the Gospel in the Stars. And be sure to download the free e-book that examines the evidences for this amazing star revelation.